The humble British 'toad in the hole' generated many, many emails from around the world requesting similar dishes. So continuing with this theme and tying in with the previous month's pastry recipes, we are going to make the quintessential British pie; made famous by the Melton Mowbray's pork pies . . . or is it? France can quite easily lay claim to this dish, because in the Provence region, there is a small village called 'Pezanas', here they have "les petite pate de Pezanas" or the small pastry of Pezanas; which are a small (two bites) pork pies. They were created in 1790 by the personal chef of Lord Clive of India; who stayed there while briefly in exile. Suffering from homesickness and a dislike of the local foods heavily laced with garlic, his chef created them for him and when they left as a show of thanks and appreciation, he presented the village with the recipe. It is now held in such high esteem, they have a culinary society dedicated to it, where on initiation (in blue graduation gowns) candidates must swear to uphold five rules and swear to it on a rolling pin. They are then presented with a medallion in the shape of the miniature pie on a purple ribbon. Most commercial pork pies however these days should really be termed 'bacon or ham pies' as they are made from cured meats and not true pork. There are many recipes for pork pies and mine is just one of them. But from this basic recipe try adjusting it to suit your own taste, leave out the cheese, omit, reduce or increase the sage etc. The pie can be made as one large pie in a casserole dish, as individual ones in deep muffin moulds or similar or made free form like the French version. 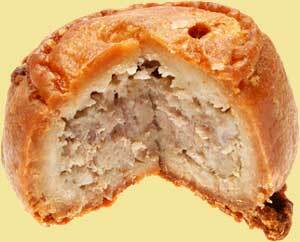 For those non British out there, the term 'pork pie' has another meaning also. People born in London call themselves Cockney's. To be a true Cockney you have to have been born within earshot of the sound of the bells of the Bow Church. Over the years, the Cockneys developed their own language, called Cockney rhyming slang. Where words or phrases are replaced by others that sound or rhyme with the original. So telling lies is known as telling 'pork pies'! So with these pork pies in the sky rockets of your new whistle and flute, you could get on the dog and bone to your friends, go down the frog and toad using your plates of meat, to the rub-a-dub, for a pigs ear, tell a few pork pies of your own and no one would be any the wiser! Email me if you can't work it out and would like a full translation! Serve your pork pie chilled with 'Branston' or Ploughman's pickle, crusty bread, a thick slice of English Cheddar, a tossed side salad and a glass of beer for a true English Ploughman's lunch! Enjoy your Pork Pie and bon appetit . . . . .